time based to weather based irrigation. For the most accurate estimate please enter the application rate per week (in millimetres) for your irrigation system. Alternatively, please enter the total weekly run time for an individual zone. e.g. if your controller is set for 20 minutes per zone 3 times per week you would enter 60 minutes (3 x 20 minutes). If you have multiple run times please use the average. Your average local rainfall is 49mm during the irrigated months. Please verify the fields marked in red. 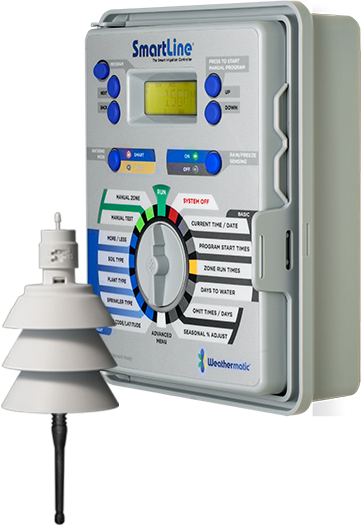 Conventional timer-based systems water on weekly schedules that once programed, are rarely changed. Because of this, they tend to over-water by 20-60%. They also do not take into account seasonal, soil, plant and weather conditions. Over-watering injures plants and creates runoff that can lead to costly damage to paths and driveways. The SmartLine system is the world's leading weather-based controller and adjusts water levels instantly to changing weather conditions helping you reduce your water usage and bills and keep your landscape in peak condition. Our online calculator will help calculate how much you could save by switching from time based to weather based irrigation. Disclaimer: Actual savings will vary based on weather, water rates, historical watering practices and overall sprinkler system efficiency.